A couple of weeks ago I went to the book launch of 'You Animal, You! ', a printed collection of Charlotte Cory's wonderful montage photographs. Charlotte's clever idea is to play with the words 'shot' and 'captured', referring in different ways to the dead animals and the photographed people. I had a good chat to Charlotte. She is a prolific and inspirational woman; an artist, novelist, photographer and playwright, with a love of history. Plus she tells me she too collects things such as clay pipes. Ooh. The book is jam-packed full of Charlotte's poignant and often amusing images. But I am not keen on the random spotty or coloured backgrounds which I think distract from the images, and many of the pictures that have been used full bleed have lost valuable information in the gutter area. Also, there is evidently no typography skill involved, which is a huge shame, especially seeing the wealth of inspiration on the calling cards and the labels of lotions and potions featured on the endpapers. And the letter-spaced headings with their heavy double underscores, combined with the justified copy is really clunky. I dunno; perhaps it's only me who notices these things, design for print, especially books and brochures, being my day job. I just remembered this... A while ago Peter Watts asked, what would you collect if money and available space were no restriction? Easy...! Bizarre taxidermy! Like these, recently on show at Peter Blake's 'Museum of Everything'. The book launch was in the Royal Suite of the wonderful St Pancras Hotel. With a name like 'Royal" I'd expected the room to be as wonderful as the adjacent renovated areas of the hotel, but it was rather a let down – all hotel-y with over-large sofas and floor-to-ceiling shelving containing arty bits that looked like they had been bought from Heals. 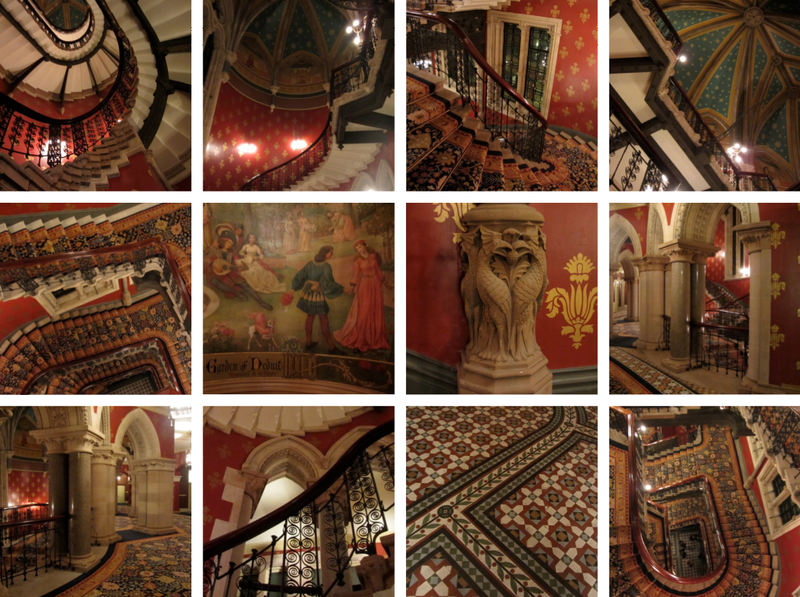 After quaffing a few tasty canapés and downing a couple of G&Ts I spent ages admiring the stairwell and adjoining corridors. It's just lovely. And assymetical. And every dragon column is different, and the clashing patterns and textures somehow work brilliantly together. The last time I'd been in there was about 15 years ago on an Open House day. On the wall behind me as I type this is a page of the Independent dated July 1995 that shows the stairwell pre renovation and I am happy to report that it looks like all 'they' have done is clean it up a bit and add some wonderfully gaudy carpet. On the ground floor I stood for ages chatting to a member of staff who was sporting a security badge. He had extensive knowledge about the history of the building. I commented that his enthusiasm was wonderful and asked if it was part of his job. No, he said, it wasn't – he just loves working there and has made it his business to find out as much as possible. How lovely. And what a lovely place to work. If you want to see the building pre-renovation you need only watch this video (shot in one take!) though, like me, you will probably have the song as an ear worm for the rest of the day now... and note how little Mrs B contributes in it except for some weird faces she pulls towards the end!